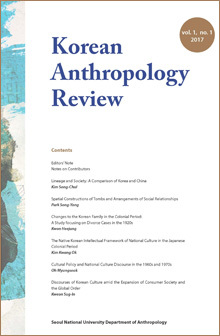 Published by the Department of Anthropology at Seoul National University, Korean Anthropology Review: A journal of Korean anthropology in translation (KAR) introduces Korean anthropological scholarship to international audiences, by carrying English translations of Korean-language articles previously published in Korean anthropology journals. KAR selects from the finest anthropological research by Korean anthropologists that builds on their particular concerns and intellectual heritage yet is open to global engagement. The aim of this English-language journal is to foster dialogues between the intellectual traditions of Korean anthropology, on the one hand, and global and other regional anthropologies, on the other. Through such dialogues, KAR seeks to contribute to the global commons of anthropological knowledge by bringing in theoretical and ethnographic dimensions salient in the Korean context yet with broader implications. It has become commonplace in the global production system for workers to relocate to various regions across the world. Companies import migrant workers by making capital and labor more flexible in order to maximize profits. As a result, sojourners-those who do not intend to settle down for good but instead are likely to return to their home countries-are increasing in number, and their transnational life patterns, woven by their movements between their homes and their resident countries, are receiving more academic attention. This article draws on South Korean managers’ experiences in Vietnam to gain a better understanding of transnationalism. South Korean factory managers, when they move from relatively wealthy South Korea to relatively poor Vietnam, tend to work in the new region without intending to permanently settle down or to be assimilated into the local culture. They are also unlikely to be victims of discrimination by native residents. Although they do not form a social majority in the region, they are allocated superior status at workplaces and in everyday contexts. Nevertheless, their life is constrained by their nationality status as foreigners and by their social class status as lowermiddle- class skilled workers. This empirical study ties the distinctive characteristics shown in the transnational lives of South Korean factory managers to their socioeconomic reproduction, as well as to the creation and care of their families. The objectives of this study were: 1) to understand present day long-term travels of Korean youth by connecting these to a “Hell- Joseon” discourse; 2) to examine the Korean phenomenon of tal-Joseon (escape from Korea), a practice that is difficult to explain through concepts related to tourism or immigration; 3) to identify the life changes travelers experience after tal-Joseon travel with a focus on their increased mobility. The results of this research are the following. First, people, mostly youths, who are frustrated by Korea’s social structure and culture are traveling abroad for extended periods to get away from Korea. Second, the migration routes tal-Joseon travelers take are different depending on the traveler’s social class. Lower-middle class youth travelers, for example, follow a repetitive pattern of physical labor in developed nations and long-term rest in developing nations. Third, the main goal sought by long-term travelers in India, one of most popular destinations for long-term rest, is “detoxing from Hell-Joseon” through rest, healing, and a search for the self. Fourth, when long-term travelers finish their trips, the meaning of “home” changes for them; an increased mobility is observed in their lives. The tal-Joseon travel phenomenon is related to an increasing global mobility, a trend of blurring boundaries between tourism and migration, and the structural problems in Korea where young people are increasingly excluded from society including the labor market. This study contributes to reflective research on those who choose to run away from Korean society and contributes to a new theory of global mobility. The number of Koryoin (ethnic Koreans in post-Soviet states) migrants residing in South Korea is escalating as a result of the combined influence of various push and pull factors. Push factors include high unemployment and an uncertain future for the younger generation following Uzbek independence and the Uzbek government’s ethnic-centric nationalism policies. Pull factors include South Korea’s high salaries and an immigration policy open to overseas Koreans. Care for elderly Koryoin remaining in Uzbekistan after their children migrate to South Korea exhibits transnational characteristics. This study examines aspects of transnational caregiving practices for Koryoin elderly parents remaining in Uzbekistan who are cared for by their adult children who have returned to South Korea. The care practices are examined within a transnationally separated extended family network of Uzbek Koryoin. The study analyzes factors that influence the transnational care practices of Koryoin children in South Korea toward their older parents. Existing research on international migration and transnational families has mainly focused on nations where migrants settle down. Overlooked are the perspectives of elderly parents of migrants. This article aims to understand the following topics from the perspectives of older parents in particular: the emotional influence of children’s international migration; transnational life and care practices of migrant children; prospects for the reunification of migrants and their parents. Multi-sited field work was carried out in South Korea and Uzbekistan to achieve these research objectives. This research examines the ways in which the ideas and mechanism of Orientalism are expressed and utilized by Western English instructors in Jeonju. Through critical and experiential analysis, I explore Edward Said’s discourse on Orientalism, the most influential argument to date regarding the relationship between the East and West. This study is divided into three parts. First, I investigate English instructors’ notions of the East before their move to South Korea. Second, I explore the changes in their notions after living in South Korea for a time. Lastly, I examine the way in which the ideas of Orientalism are utilized by the instructors. I conclude that even today, English instructors in South Korea are bound by the pervading notion of Orientalism. Even so, they are not consciously aware of the concept nor are their daily actions deliberately informed by it. Yet, they experience changes in Orientalism in unfamiliar situations and strategically utilize its ideas to maintain their identity and resolve conflict. In other words, Orientalism doesn’t operate as a fixed system that constantly buoys Eurocentric notions; it is flexible and dynamic as its influence weakens or strengthens depending on context. Exclusion of and discrimination against migrant workers in South Korea have long been popular research topics for anthropologists and other social scientists. Whereas earlier research focused on the status of migrant workers as minorities and their exclusion from mainstream Korean society, this article examines how long-term migrant workers have adapted to South Korean culture, what kinds of qualifications and opportunities they have gained in South Korea, and how their lifeworlds changed as a result. While exploring how and in what contexts the South Korean nation-state realized and executed violence on migrant workers, the analysis turns to how migrant media activists resisted this violence through protests and media productions. By illustrating the activities of migrant media activists and their production of media contents, the article argues that the lives of migrant workers have been equally shaped by the biopolitics against migrant workers in Korean society and the identity politics of migrants’ struggles to be recognized as social beings. The steep rise in international marriages since the mid- 1990s indicates a fundamentally different phenomenon from the international marriages that took place in South Korean society in the past. Most of the international marriages after the Korean War took place between American soldiers and Korean women or between affluent Japanese men or Western men and Korean women. Since the beginning of the 1980s, Korean men have been marrying women from countries with less prosperous economies. The frequency of this kind of marriage increased rapidly after the mid-1990s. There is especially a noticeable growth in the percentage of marriages between women from Asian countries with less developed economies and Korean men from rural areas or low-income Korean men from urban areas. Korean women are also increasingly marrying foreign male laborers in South Korea.